We all know that posture is important for good health. Some say that its as essential as a healthy diet, sleeping comfortably and exercising. The first step to developing better posture is being aware of any potential issues. 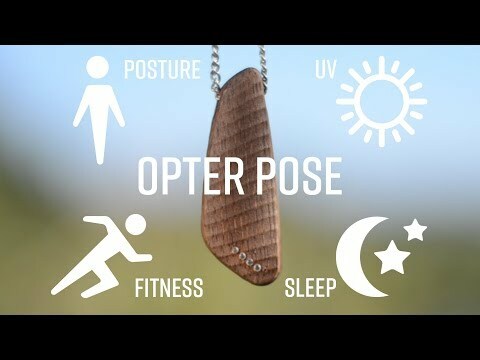 A new multi-purpose wearable has just hit Kickstarter for those wanting to improve their posture habits and reduce stress and strain on their spine. Opter Pose is minimalist and inconspicuous device. In addition to posture, it also monitors physical activity and ultraviolet (UV) exposure throughout the day, and sleep at night. Made from real bamboo, the stylish wearable is designed to be worn as a necklace, or attached to your shirt, bra or tie. Pose learns your ideal posture when you calibrate it, then warns you by vibrating when it detects you’re slouching. It also dishes out notifications if you’ve been sitting around too long. All of this is customizable, and you can set the vibration strength, minimum time interval between vibrations and quiet hours when you do not wish to be disturbed. The lightweight device doubles up as a basic activity tracker and will keep tabs on your steps, exercise and calories. At night it will track your sleep, letting you know how restless you were, and helping you nod off at the most effective times for your body. There is also a quiet vibration alarm. More interestingly, the wearable tracks Blue light. This type of light is emitted from modern day appliances, such as your phone, computer and TV. Reducing exposure can be important to improving your mood, productivity and especially sleep. Finally, Pose also keeps tabs on UV exposure. We all know that too much sun makes your skin age faster and can even be dangerous to your health. The wearable tracks how much you’ve gotten each day and dishes out notifications in real-time as your exposure crosses various thresholds. The Kickstarter campaign opened recently and is very close to meeting its goal. With nearly a month to go, there is still more than enough time to reach the $15,000 necesary to make Opter Pose a reality.